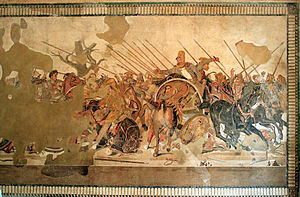 The Alexander Mosaic illustrates a battle in which Alexander faced and attempted to capture or kill Darius. Alexander defeated him at the Battle of Issus and two years later at the Battle of Gaugamela. The work is traditionally believed to show the Battle of Issus. The mosaic is held to be a copy of either a painting by Aristides of Thebes, or of a lost late 4th century BC fresco by the painter Philoxenos of Eretria. The latter is mentioned by Pliny the Elder (XXXV, 110) as a commission for the Macedonian king Cassander. Alexander and Darius Detail showing Alexander Reconstruction of the mosaic depiction. Despite being partially ruined, the two main figures are easy to recognize. The portrait of Alexander is one of his most famous. Alexander's breastplate depicts Medusa, the famous Gorgon, and his wavy hair is typical of royal portraiture as established in Greek art of the fourth century B.C. He is portrayed sweeping into battle at the left, on his famous horse, Bucephalos, and focusing his gaze on the Persian leader. Darius is shown in a chariot. He seems to be desperately commanding his frightened charioteer to flee the battle, while stretching out his hand either as a mute gesture to Alexander, or possibly after throwing a javelin. He has a worried expression on his face. The charioteer is whipping the horses as he tries to escape. The Persian soldiers behind him have expressions of determination and consternation. Other featuresDarius's brother Oxyathres is also portrayed, sacrificing himself to save the King. Radical foreshortening - as in the central horse, seen from behind - and the use of shading to convey a sense of mass and volume enhance the naturalistic effect of the scene. Repeated diagonal spears, clashing metal, and the crowding of men and horses evoke the din of battle. At the same time, action is arrested by dramatic details such as the fallen horse and the Persian soldier in the foreground who watches his own death throes reflected in a shield.